Spyderco is a company that specializes in quality blades and knives that outperform and outlast those of their competitors. With over thirty years of research and development, they have developed knives and knife sharpeners with superior quality and durability. Their research led to the creation of features that are common on many modern knives such as serrations, an opening hole, and the pocket clip. Since the creation of their first knife in 1976, their dedication to superiority and innovation has provided their customers with features that are sensible and useful. Spyderco is known for focusing on quality and performance rather than aesthetics, and while the knives are visually pleasing, they are designed first and foremost to perform well. The Spyderco Delica 4 is a bestselling dependable model with a 7.125” length, a closed length of 4.25” and a blade thickness of 0.93”. The Delica has been in production in various form since 1990 which has allowed for the evolution of this popular knife. The most recent model has improved screw construction that allows for easier cleansing. Dual skeletonized stainless steel liners located inside the handle improve both the weight and durability of this model. The Delica’s handle is fiberglass reinforced nylon that comes with Spydero’s own Bi-Directional texturing to provide a high performance grip. The blade of the Delica is saber-ground with a stronger tip than previous models. There is added functionality with a four way clip that rotates according to the user’s needs. Another bestseller, the Endura, weighs approximately 3.6oz. With a 3.75 inch blade, the Endura is a relatively large folding knife, but the lightweight build allows it to avoid weighing down pockets. 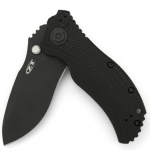 It is available in either serrated or clean edge. The VG-10 steel blade sports a fine carbide structure that effortlessly holds a sharp edge. The VG-10 outperforms other steels on the market in rust prevention. This knife was build to be lightweight enough to take anywhere, and durable enough to meet whatever needs arise. 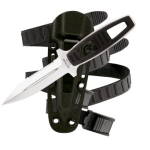 The four way clip adds to its versatility, and the handle is also equipped with dual skeletonized stainless steel liners that are designed to keep weight lower while maximizing performance. There is deep jimping in the spine that works to keep the blade from escaping from grip at an inopportune moment. 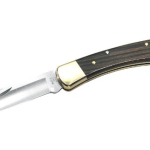 “Millie”, the military model manufactured by Spyderco, was designed by owner Sal Glesser after being asked what type of foldable knife he would send with his son if he was in the military. Millie was designed to be indestructible and absolutely fail safe as its use in the field would not allow for anything less. Glesser knew that military use would require excellent cutting performance and impeccable edge life. Millie’s blade is made of CMP-S30V stainless steel, and paired with a slender G-10 handle. The ergonomics of the knife were designed for easy maintenance cleaning on the field. Millie is 9.5” when open, and 5.5” when closed, and the total weight is a comfortable 4.2oz. 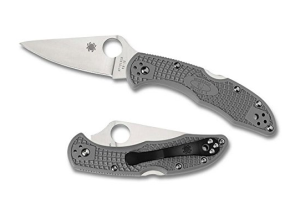 For bigger hands and larger cutting projects, Spyderco sells the Manix2 XL. With a plain edge and a non-reflective diamond like coating (DLC), this blade is ideal for tasks that require a large blade with strength. The clip is designed with skeletonized liners, and for added support, there is jimping on the spine and coil. The handle is all black G-10. 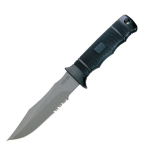 The overall length of the knife is 8.94”, while the closed length is 5.09”. The Manix2 XL weighs 5.2oz and is comfortable for ambidextrous use. The blade is incredibly sharp, and relatively light taking the size into consideration. The thin profile allows the knife to remain practical in pockets and storage, while still maintaining functionality for those larger, tougher projects. As a member of the Salt Series line, the Dragonfly2 Salt is designed to tackle projects and tasks that require a blade that is water friendly. 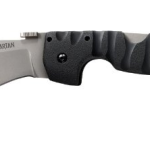 Its 2.25” blade is made of H-1 steel that is carbon free to eliminate worrying about the possibility of a rusty blade. Both plain and Spyderedge options are available for blade configuration. Molded with Bi-Directional Texturing, the handle is created with fiberglass reinforced nylon and designed to fit hands comfortably and prevent slipping or sliding when in contact with water. One of the best selling points of the Dragonfly2 Salt is that the blade feels and behaves like a much larger one, largely in part to the leveraging from blade to handle. At 1.2oz, the knife is both lightweight and reliable. It holds up excellently to everyday tasks, but is a special friend to fishermen. Spyderco has set themselves apart from other companies that simply produce the same knives with inferior quality. With cutting edge development and research, there is a reason why knives like the Delica, Endura, Millie, Manix2 XL and Dragonfly2 have become best selling knives. They are reliable and sturdy, with blades created to live up to their individual tasks, and each is designed with ease for the consumer and reliability for performance in mind.